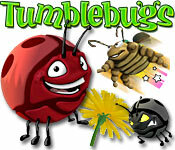 Tumblebugs is rated 4.6 out of 5 by 10. Rated 5 out of 5 by navajoeyes2 from A blast Very enjoyable. Each stage was a little different and fun. Graphics were fun & whimsical. I played it many times over. Rated 5 out of 5 by meltod1995 from Great Marble Popper With Many Great Levels! This game gets difficult, not as difficult as the sequel, but still difficult. The music in this game is fantastic, some of the best I've ever heard, and a lot of the levels are amazing. Also, I've heard people say 12 - 8 is difficult. I personally don't agree, I find it to be really easy (nothing compared to the final level of the sequel). The worst part about this game is probably stage 11. They pick a lot of levels I really don't like playing, personally. Regardless, great game! Difficult, but great! Rated 5 out of 5 by purpleporpoise from Don't let the cute factor fool you . . . Very challenging marble popper game! I played this game for about 5 minutes in demo mode before I decided to buy it. I'm a total newb and I'm still on Level 2, so it will definitely keep me busy for awhile. Marble popper games are not usually my favorites, but that may change. I love this game almost as much as Bird's Town. I had to get used to how to use the mouse pointer. It's a little different than Bird's Town and there was a learning curve. I would definitely recommend a good, precise mouse for this game. Mine's not that good and doesn't always point where I want it to and the stupid cord gets in the way. I need lots of room to move the mouse around on my desk, so keyboard, papers, everything gets pushed to the side - LOL! I depend on the cursor to bulls-eye the targets a little more than I do in Bird's Town, where I basically just aim and shoot. 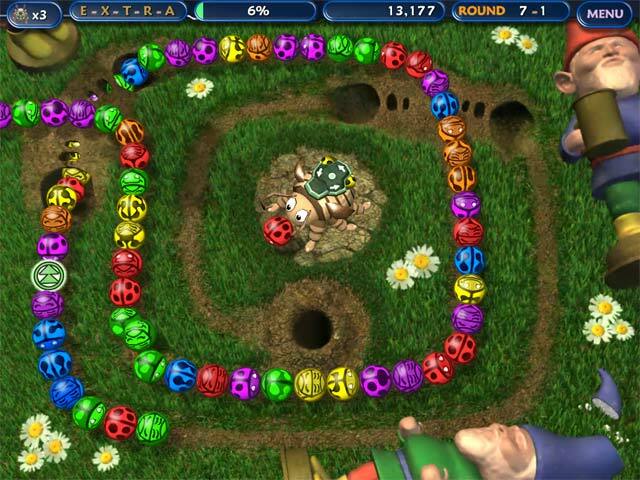 But I really like the game and the tumblebugs are super cute. The ominous-sounding growl that comes out of the black bug's hole after it captures all your bugs is great! Fun game for kids of any age from 5 to 65. But don't let the cute factor fool you. The levels are very challenging. Rated 5 out of 5 by Tarnea129 from A bug can do what he/she wants. And this bug wants to be a hero!This game is amazing,due to the fact that its one of the 3D Marble Popper games.It also has many challeging levels.Nobody can defeat this bug! Rated 4 out of 5 by mrm2006 from Tumblebugs Revisited? No, I don't mean to be referring to the 2nd Tumblebugs game. I am referring to a big case of deja vu. Because I could have sworn, in another lifetime, many moons ago, when dinosaurs roamed the Earth, I owned this game on another game site. I remember the shooting to make groups of 3 or more matches as the bugs ran along not just one conveyor belt, but sometimes 2, and sometimes you could jump between the 2 lines and shoot and jump back to the first and sometimes you just had to shoot into both lines from 1 position. I remember the power-ups that would stop the lines, reverse the line, shoot a fireball into the line, and many more. I remember the winding trails and the many holes where I couldn't even FIND the end until I saw that blinking red exclamation point that signifies the "death hole" came into sight. I even remembered the levels I had trouble on. What I DIDN'T remember was the witty, and often humorous. "tips" between levels. SOME referring to the game, while most referring to life's little moments - lol. Seriously, read every one because you'll get helpful game advice in those tips. What I also DIDN'T remember was the comic strip-type story that continued between every "main" level (vs. the sub-levels). This game is extremely fun AND extremely challenging. The graphics are bright and colorful. The music I can't comment on because I turn that way down in "options". Save up those extra lives that are so easy to acquire because after Level 5 starts, that's when it gets very difficult and you start to lose those precious lives (that you just accumulate again). Why did I only rate it 4 stars? No options for different difficulties, That would have been a major PLUS. The "bonus game" was really no different that the regular game and something different to break up the monotony of the game would have been nice as well. There are 12 main levels to pass and between each "main" level there are sub-levels (i.e., 1-3, 5-2). The sub-levels increase as you "main" level up. I got up to Level 6-2 before the demo ended, so it almost sounds like half the game, and I lost 2 lives at Level 5-1 and 5-2. So, not sure how long the game, time-wise, would be for me. That's the only reason I wouldn't purchase this game (again?) and because as it gets extremely hard, my older hands can't move quite that fast anymore to keep up with those buggies. I hope this encourages you to try the demo. Purchasing a game is always a personal choice. Go get those bugs and Happy Gaming! Rated 4 out of 5 by nurister from a very nice game Beautiful graphics, cute story, good game behavior, very pretty! It has been a pleasure. Rated 4 out of 5 by rkhayden from Undefeatable bugs Bought the game, stuck on level 12, and I thought level 8 was tough. I will be playing it for awhile before I get through. Rated 4 out of 5 by vonstallog from Family Marble Game I've played this in the past on demo and enjoyed it, so thought to purchase the whole game. The challenge gets harder as you play and I actually have difficulty getting through the levels. 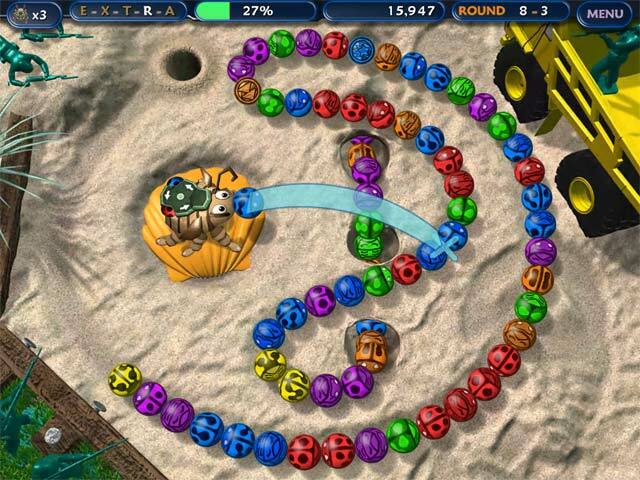 The marbles move quicker and add more of them, as you advance. I'm sure someone that is a faster clicker than I, could easily finish. LOL! Anyone that can play Luxor's games, would probably think this game is a walk in the park!!! Don't expect a bunch of exploding objects with this one, it's not that type of marble game. It's more on the 3+ matching than anything else. The theme may be more suitable for younger players or the young at heart, so it's perfect for the whole family!